In a blistering attack in the first PMQ’s after the summer break, PM Theresa May was accused of turning Brexit into a power grab by – HER OWN Conservative MP Anna Soubry. Nottinghamshire Conservative MP Soubry, who has previously very publicly spoken out against Brexit, immediately stated her ‘very serious concerns’. Soubry, who has always stuck to her guns as a vociferous remainer, was given the first question of Prime Ministers Questions – traditionally an easy question from an ally designed to flatter the PM. 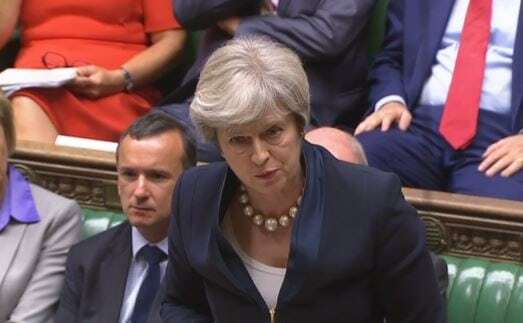 Instead a fractious PMQ’s began with friendly fire for Theresa May, already looking like a lame duck Prime Minister after a summer of feverish briefings and speculations about her leadership. Prime Minister May, responded by saying that she would happily meet with her, while also making it clear that Soubry will be supporting the PM with Britain’s EU exit. Anna Soubry’s unprecedented PMQ’s ambush of Theresa May follows her warning this week that Conservative MP’s who have serious worries about the European Union (Withdrawal) Bill setting the UK up for a massive power grab by the government are being bullied by the Tory whips. And human rights watchdogs Amnesty International and Liberty called on MP’s from both sides of the House of Commons to amend the Bill to include a binding commitment on the Government to prevent it eroding Brits’ rights. “Sovereignty” was a cornerstone of the campaign to leave the EU. If Theresa May is hoping for a “power grab” of our rights and laws enshrined in EU membership, as Anna Soubry MP warned today, she will clearly not only face a bruising battle with the opposition benches, but her own MP’s.